Noted waterfowler Fred Zink, has had tremendous success with Ohio's big and early geese on the Mercer County Wildlife Area in Western Ohio. "Here they come--get ready," Fred Zink whispered. In the distance, beyond a line of tall oak trees, we could hear the loud, excited chatter of a flock of geese as they lifted from the ground and began to gain altitude. "They're coming this way. Watch the gap," Fred whispered. The "gap" he was talking about was a natural V-shape in the tree line where one or more of the giant oaks had toppled in years past. No more than 200 feet wide, the gap posed the easiest route for the Canadas to leave the adjoining field, a part of the Mercer County Wildlife Area near Grand Lake St. Marys in west-central Ohio. Within seconds, we could see the wing beats of two-dozen Canada geese through the trees, even though the oaks were still heavy with green leaves. Sure enough, the birds were heading for the cut. The blind--one of three that Fred had constructed--was located slightly to the side of the gap but still close enough for accurate shooting at anything that passed through. The geese, if they maintained their present course, would clear the fence line, climb a bit higher over the standing corn that surrounded the pit and wing their way toward distant grain fields or nearby golf courses and city parks. The surface of 12,000-acre Grand Lake St. Marys also beckoned a short distance to the north. Our mission was to short-stop a few of the big birds before they cleared the standing corn. On they came, their chatter increasing in volume as they topped the saplings along the fence line, through the gap and straight across the cornfield. "Now," Fred shouted, and we threw back the blind cover panels and took sight on the geese that were now no more than 30 yards above us. Five 12 gauges erupted in unison, and birds began to fall into the standing corn. The Canadas, forgetting their summer sluggishness, turned on their afterburners. I shot, missed and pumped another round into the Super Mag 835 Mossberg that I had choked down like a rifle. My second shot was more carefully aimed, and I managed to drop a plump bird that fell cleanly into the corn. The action lasted no more than a few seconds, but the level of exhilaration among our hunting crew in the blind was out of sight. "Wow! Wow! Wow!" Sherry Makela exclaimed, as she tried to scale the flat walls of the pit blind to retrieve her very first Canada goose. Sherry and Ed Rylee, also in the blind, are partners in the Outdoor Alliance Group, a public relations and promotions company that places outdoor communicators face to face with their clients who represent some of the largest outdoor-product manufacturers in North America. They were also friends with Fred, a championship goose caller and producer of his own line of outdoor products. They had invited me to come and share in their good fortune. Here it was, the first day of September, when ordinarily I would be heading for the mourning doves fields in the South. Instead, I had pointed the hood of the pickup north from my home in eastern Kentucky to give one of America's earliest goose season openings a try. To say I was delighted with Sherry and Ed's invitation after the first volley of the morning would be a major understatement. Not only had we clobbered the first geese of the day--perhaps of the season anywhere in the country--but we had also enjoyed some "icing on the cake" in the form of both leg and neck bands! In fact, every goose we downed was banded! Fred noted that because there is a high incidence of banded birds in the bag, hunters from all over Ohio and several surrounding states target the early season in this region. A hunter who goes away from Fred's place without a few bands to add to his necklace probably can't shoot well. Checking my watch, the first flight of Canadas had cleared the fence line about five minutes after 7 a.m., just as Fred had predicted when I was in the first stages of planning the visit. "They usually fly off the refuge about seven, unless the day is one of those 90-degree scorchers. Then, they may leave a half-hour earlier," he explained. Fred said the flights usually last for two hours in the morning, before tailing off to only a few geese flying in and out of the 380-acre wildlife area throughout the rest of the morning. If the limit of two geese per day isn't reached during the morning hunt, hunters who know the area well can move to various grain fields where geese usually go to feed during the rest of the day. "What we're doing here is taking advantage of two situations," Fred noted as we collected several plump geese from the first flight and returned to the blind for a second try. "We have an abundance of resident birds whose numbers are growing dramatically each year. But because geese can pose significant problems to grain farmers and pose a substantial nuisance on state and city parks, golf courses, lawns and other grassy areas, the Ohio Division of Wildlife schedules the early two-week season to try to thin the population to a more socially acceptable number." Sherry Makela and her guide pose with giant Canadas taken during the first round of shooting in Mercer County, Ohio. One of these birds was Sherry's first Canada. There is little water in this heavily urbanized region of western Ohio. Grand Lake St. Marys and nearby Indian Lake attract resident birds. Essentially, all the waterfowl that live or stop in this large area of Ohio pretty much concentrate on these two lakes. It didn't take long for our party to get another chance at the big, early birds. No sooner had we collected downed birds from the surrounding standing corn and settled back into the blind, the sound of geese taking off from the nearby preserve broke the silence of the warm morning. Sure enough, the natural wedge created by the fallen trees, once again beckoned the unsuspecting geese. This time, maybe 50 Canadas streamed through the gap and flew smack over the top of our blind! Taking a bead on the lead gander, my fingers tightened on the Ulti Mag that suddenly spit out a lethal load of #4 Kent Tungsten Matrix. The big goose folded in midair like it had been hit with a sledgehammer and dropped to the earth instantly. I had my own "wows" to proclaim. Was this load of nontoxic shot even better than lead, as many had proclaimed? That second flight was enough to fill our limits. In a short hour, five of us had taken 10 giant honkers. I would learn that this type of shooting is common during the first few days of the early opening. Fred said when he first started hunting geese in this area of Ohio about 17 years ago, top local hunters would bag seven or eight geese a season. But after Ohio began to manage the giant race of Canada geese at Mercer and three other wildlife areas across the state, these non-migratory birds rapidly increased their numbers. Wildlife managers in Ohio grew concerned the birds were utilizing too much of the food needed to attract and fuel migrating flocks. To thin the numbers of resident birds and reduce crop depredation as well as to maintain food for migrants that begin arriving in Ohio in mid September, the Division of Wildlife successfully convinced the U.S. Fish and Wildlife Service to grant the Buckeye state a 15-day early season. Todd Haines, the District Five Wildlife Supervisor in Xenia, said Ohio had to prove the geese taken during the early season would account for less than 10 percent of the total number of birds taken, including migratory geese. 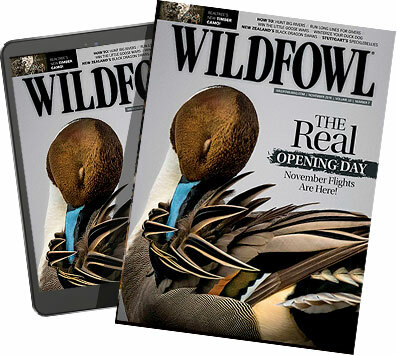 Mandatory check-ins of all geese harvested when the early season first opened in 1995 proved that almost all of the early season birds killed were of the giant (local) race. Today, the early season is doing everything biologists had hoped it would. An abundance of resident giant Canadas has made Fred Zink and many other hunters in Ohio and nearby eastern Indiana very happy.